Kia SP-concept based compact SUV spied in Mumbai. The compact SUV will kickstart Kia’s Indian operations. Production-spec SUV could be called the Tusker or Trailster. Likely to be launched by September; will rival Hyundai Creta. 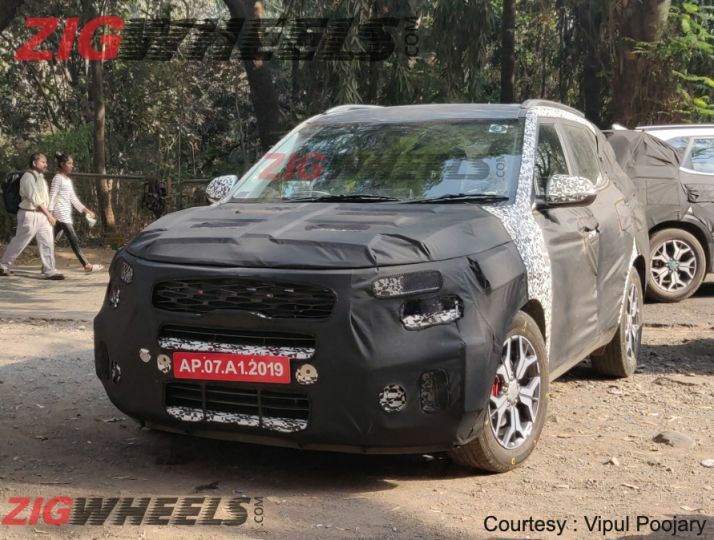 Kia’s upcoming compact SUV based on the SP concept that was showcased at the 2018 Auto Expo has been spied testing yet again, this time on the streets of Mumbai. While the test mules were covered in heavy camouflage, they do reveal some interesting details about the Hyundai Creta rival. First off, both SUVs seem to be the top-spec variant as they get larger machine-cut, multi-spoke, 17-inch alloy wheels. Likely to be called the Kia Trailster or Kia Tusker, the compact SUV seems to be slightly larger than the Hyundai Creta. Not only does it look beefier from the rear, it even seems that the Kia has a slightly longer wheelbase than the Hyundai. This has allowed Kia to add a rear quarter glass, which is something that is missing on the Hyundai. This feature alone should make the cabin feel a lot more airier than the Creta’s. Apart from these details, we already know that the Kia SP concept-based SUV will feature the clamshell bonnet from the SP concept shown at the 2018 Auto Expo and that the ‘tiger nose’ grille will be flanked by LED DRLs. As is the trend with SUVs these days, the headlamps and fog lamps will be positioned lower down on the front bumper. At the rear, the LED tail lamps will be connected via a thick slab of chrome. The upper half of the tail lamps will feature turn indicators and reverse lights while the lower half houses the stop lamps. The Kia SUV will even feature a shark fin antenna for a dose of sportiness. Although none of the test mules spotted so far featured a sunroof, expect the final production version to feature one, at least in the top-spec variant. Inside, expect a freestanding infotainment system with support for Apple CarPlay and Android Music, automatic climate control and ventilated front seats. It will also feature one-touch power window functionality on all doors, and a rear bench with three adjustable headrests. For safety, the Kia compact SUV will feature disc brakes on all four corners, dual airbags, ABS with EBD, and ISOFIX child seat anchors as standard. Kia has already stated that the compact SUV will be offered with a set of BSVI-ready 1.5-litre petrol and diesel engines. It even added that there could be a plug-in hybrid variant in the future. However, the company is yet to share a timeline for the same. Set to be launched by September 2019, the Kia SP concept-based SUV is likely to be priced in the Rs 10 lakh to Rs 16 lakh range, taking on the Hyundai Creta, Nissan Kicks, Renault Duster and Captur as well as the Maruti Suzuki S-Cross. It will also have to contend with the Volkswagen T-Cross and the Skoda Kamiq SUVs in 2020.